Searching for the white gold and the ultimate thrill, the OXBOW team made up of the riders JP Solberg (Norway), Kalle Ohlson (Sweden), Thomas Gérin (France), Adan Basserba Berrocal (Spain), Thomas Delfino (France), Sophie Rodriguez (France) et David Livet (France); headed off to the world's mountains carving fresh tracks through the powder. In total 9 countries were explored by this group of snowboarders searching for the ideal spot: The United States, Canada, France, Russia, Italy, Alaska, Sweden, Norway and Japan. Cliff drops, fresh powder, and virgin landscapes, this production highlights an authentic state of mind that the cameras of INVERT and their partners, YES (Paul Watts filming JP Solberg) and PIRATES (Basti Balser filming Kalle Ohlson), have managed to recreate to perfection. "It's just awesome to have worked on a 100% backcountry movie, we really have filmed some incredible images this winter with deep snow and big pow pillows. 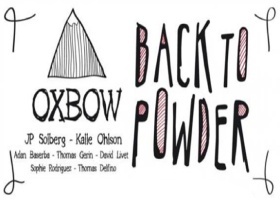 It's my first film with my OXBOW team-mates, I can't wait to see the results" says JP Solberg. Yet again OXBOW demonstrates its commitment to its riders and its passion for freestyle and backcountry snowboarding. With this new production the brand promotes its values, displaying the wonderful playground that Nature offers. Freestyle, Thrill and Fun are all there in this new out-of-this-world production.